Compared to twenty years ago when I started writing about food when ingredients like frikeh (or freekeh) and argan oil were known to only a few westerners, there are now less and less secret ingredients, or indeed cuisines. You would think that with diners’ enthusiasm for global dishes and ingredients there isn’t much left for chefs or keen cooks to discover. But there is. And this is what we did last month at Books for Cooks, when I and Nadya Saleh from the National Museum of Qatar‘s Food Forum together with the delightful and very talented Aisha al-Tamimi introduced a keen audience to Qatari dishes they were totally unfamiliar with. 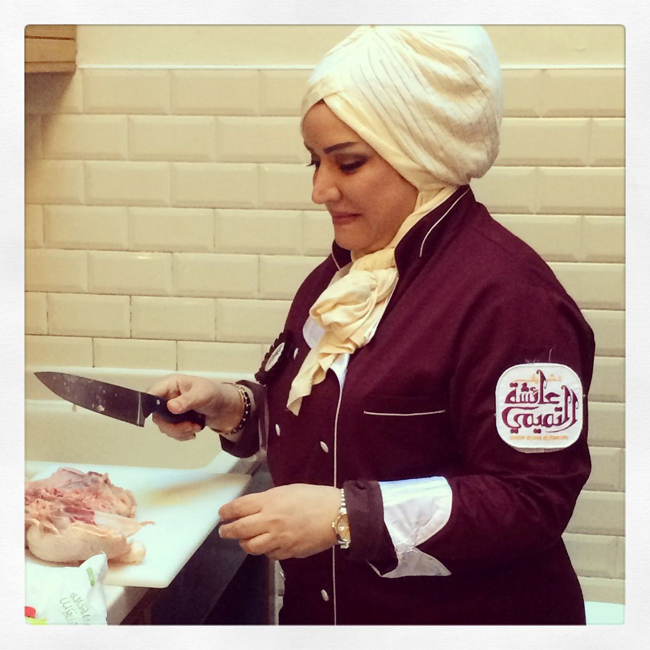 The two cooking demonstrations were led by Aisha and were part of Nour Festival and Qatar UK, the latter being a collaboration between Qatar and the UK to exchange cultural and art events while the former is an initiative by the London Borough of Kensington and Chelsea to showcase Middle Eastern art and culture.